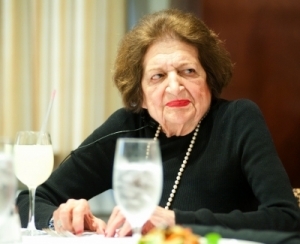 The passing of longtime UPI journalist Helen Thomas is a sad day for all journalists and especially for women who have followed in her pioneering footsteps. Helen was not only one of the first women to cover the White House, she was among the small group of women who were the first to join the National Press Club in 1971. While that happened way too late, I and others who followed her appreciate the determination she showed in knocking down the barrier that had kept women in the balcony at the Press Club. This year as we focus at the National Press Club on women, this history is especially important. In March, during Women’s History Month, the lobby of the Club featured an exhibit that included a spectacular photo from 1971 of those brave women. In the photo, on one side, was Helen. Her photo also hangs among the head shots of former presidents on the 14th floor as she had led the Washington Press Club, which merged with the National Press Club in 1985. Helen didn’t stop with being one of the first women to join the Club. She broke the gender barrier again to serve in Press Club leadership, including as chairwoman of our board of governors. While she always worked hard and barely retired, she made time to talk with young journalists to tell them about her career. In the 1990s, as a University of Missouri student here for a Washington semester, I was one of those students. Sitting by Helen at a restaurant near the White House and hearing her hold court and take our questions was one of the highlights of that semester. Even in her last years, as her health failed, she came to the Press Club when she could to dine or to meet friends. Her spirit will live on here through the history she made and the inspirational example she set to challenge conventions and break down barriers. Click here to watch a video clip in which Helen Thomas speaks about winning the NPC's Fourth Estate Award. Click here to watch a video clip in which Helen Thomas talks about discrimination against female journalists. Click here to watch a video clip in which Helen Thomas speaks on the role of the press in a free society.